"Croatian Armed Forces" redirects here. For other uses, see Croatian Armed Forces (disambiguation). 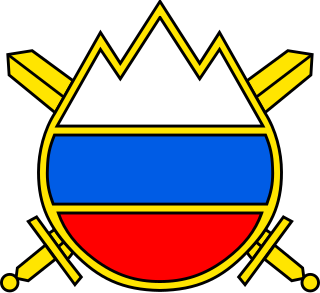 The Republic of Croatia Armed Forces (Croatian: Oružane snage Republike Hrvatske – OSRH) is the military service of Croatia. The Croatian Armed Forces are charged with protecting the Republic as well as supporting international peacekeeping efforts, when mandated by the NATO, United Nations and/or European Union. The Army has 650 AFVs, around 150 pieces of artillery, 100 MLRSs, around 70 tanks, and 20 SPGs. The Air Force has 12 MiG-21 jet fighters, 10 combat-transport Mi-171 and 16 OH-58 attack helicopters. The Navy has 29 ships, out of which five 60-80 metre fast attack craft are used in offensive capabilities. The total number of active military personnel in the Croatian Armed Forces stands at 14,506 and 6,000 reserves working in various service branches of the armed forces. In May 2016, Armed Forces had 16,019 members, of which 14,506 were active military personnel and 1,513 civil servants. Of the 14,506 active military personnel, 3,183 were officers, 5,389 non-commissioned officers, 5,393 soldiers, 520 military specialists, 337 civil servants and 1,176 other employees. Total available male manpower aged 16–49 numbers 1,035,712, of which 771,323 are technically fit for military service. Male citizens are now no longer subject to compulsory military service since January 1, 2008. However, the last generation of 2007 servicemen was also absolved of compulsory service by an act from then Minister of Defence Berislav Rončević. The Croatian military budget for the past 6–7 years was kept below 2% of GDP, a vast difference from the 1990s when defence expenditure represented a major stake in Croatian budgetary expenditure due to the Croatian War of Independence. For example, 1995 Croatian defence budget stood at 12.4 billion Croatian Kuna or just over 12% of GDP, which was also the highest defence expenditure rate ever. Although the budget has been decreased from year to year, the Croatian Armed Forces were able to maintain military readiness and to participate in major NATO exercises in Croatia and overseas. This downsizing of the armed forces has allowed for more funds to be allocated to modernisation over the past few years with an average of 1.6 billion kuna spent on modernisation, infrastructure and construction of new facilities. A $3 billion modernisation plan was proposed by the then Prime Minister Ivica Račan of the SDP led government in 2003, with planned modernisation starting in 2006 and ending in 2015. However it has been delayed in part due to the subsequent economic recession, but also due to serious corruption that has cost the Croatian MOD several billion kuna since 2006. A new plan under former Prime Minister Zoran Milanović should define exactly how and what the Croatian armed forces should look like by 2023. A defence white paper was published in 2015 with emphasis placed on modernisation of the Army. The Dr. Franjo Tuđman Military Academy acts as a school of higher learning responsible for training and educating future generations of military personnel. The academy consists of several schools including "Ban Josip Jelačić", "Blago Zadro", "Katarina Zrinska", the Officers Academy, and a school for non commissioned officers. The academy has 300 full-time staff and is the only military academy in Croatia. Each year also 100–120 foreign nationals attend the academy. One of 74 Croatian-built M-84A4 Sniper main battle tanks in service with the Croatian Army. MiG-21bisD fighter jet of the Croatian Air Force. They were modernised in Ukraine in 2014. The Commander-in-Chief of all Croatian armed forces in peace and war is the President of the Republic. The Commander-in-Chief prescribes the organisation of the Croatian Armed Forces at the proposal of the Chief of General Staff, with consent of the Minister of Defence. The Armed Forces consist of peacetime and wartime components. The peacetime component is composed of the active military officers, civil servants and employees in the Croatian Armed Forces, cadets, and conscripts serving a 6-month national service and reservists when on military exercise. The wartime component of the Armed Forces includes all other reservists. The General Staff is part of the Ministry of Defence in charge of commanding, training and use of the Armed Forces. It also has a number of units under its direct command, including the Special Operations Battalion, Honour Guard Battalion and several others. In peace, the Commander-in-Chief exercises his command through the Minister of Defence. In war and in cases where the Minister of Defence is not fulfilling his orders, the Commander-in-Chief exercises his command directly through the General Staff Commander. The Croatian Parliament exercises democratic control over the Armed Forces by adopting defence strategy, defence budget, and defence laws. Special Forces Command (Zapovjedništvo specijalnih snaga, ZSS) was established in February 2015, succeeding the Special Operations Battalion (Croatia), in accordance with the Long-term Development Plan of the Croatian Armed Forces in the period 2015–2024. The command staff is composed of the members who served in the special units, guards brigades and reconnaissance units of the Croatian Armed Forces. The main mission of the Special Forces Command is to ensure combat readiness of the special forces in the protection of the territorial integrity, sovereignty and independence of the Republic of Croatia, as well as for the participation in NATO-led operations. Colonel Perica Turalija is the current commanding officer of the command. The Croatian General Staff exercises direct command over the battalion which thus elevates the unit to strategic level deployment for quicker reaction and overall better and faster response to tactical and strategic situations. Also, this means that members of all three branches of the Croatian armed forces can apply for selection. Other special operations units are the Military Intelligence Battalion (Vojno-obavještajna bojna, VOB) and Special Military Police Company (Satnija specijalne vojne policije, SS VP). The duties of an Honour Guard are performed by the Honor Guard Battalion (Počasno zaštitna bojna), located at Zagreb in the Tuškanac military base. A long term modernisation plan for 2015–2024 has been published outlining overall goals and is available for download (102 pages) at the Ministry of Defence of Croatia website. According to earlier reports from the government, the Croatian Armed Forces are set to receive vitally needed new equipment. Modernisation of M-84A and M-84A4 Snajper MBTs and upgrade to M-84D standard. The programme is at a standstill and is unlikely to receive further funding due to high costs involved of nearly 20 million kuna per tank, but overhaul of existing fleet might be completed by the end of 2017 at cost of 120 million kuna (24 vehicles already overhauled at cost of 60 million kuna). The Croatian Army is looking at replacing 128 M80A IFV in its inventory, CV-90 and Puma are front contenders. Croatian Army requires 108 Vehicles, 88 Infantry combat vehicles, 4 Driver training vehicles, 8 Armoured Ambulance vehicles and 8 command vehicles. Budget for 108 Vehicles hasn't yet been set, however €400 million is projected cost of the vehicles. Croatian version will also come with 30mm cannon and twin anti tank launchers. Likely purchase of said vehicles is expected after 2021. Talks are being held with US and German governments on possible purchase of M270 Multiple Launch Rocket System, Croatian requirements call for initially 8 systems to form a two battery teams at independent Artillery regiment, with potential for further 16 systems to equip 2 active brigades for total of 24 systems + simulators and training aids. Number of systems Croatian Army might purchase will solely depend on price of the entire purchase and delivery dates, Croatian Defence budget has set aside some 200 million kuna or $32 million for this programme, although it is likely said systems might be donated by the US for symbolic price in turn Croatian MOD paying only VAT. The initial order of 8 Elbit UT30Mk2 CRO unmanned turrets for Patria AMV, armed with 30mm gun and Spike launchers in 2019, value of the contract: $14.9 million. Scores of smaller programmes, communication equipment, night vision capability, electronic sensors, NBC equipment, battlefield management systems and modernisation of artillery systems with new sights and electronic fire control systems are planned. Procurement of advanced short to medium range NATO SAM system. As of now no real funding has been mentioned other than the statement that this project is a priority and current requirements call for one battery. Estimated value – $50–70 million for new system. Alternately a second-hand system might be obtained as a donation by the United States, in which case only the VAT cost will be incurred. Procurement of short range SAM systems – no indication of what system or specifications other than a requirement for a range of up to 10 km. Intent is for up to 3 batteries with one battery being ready by 2015/6. Total funding for this programme has not been made public yet, but similar western systems tend to be in range of $17–20 million per battery. On 29 March 2018, the Croatian Government unanimously adopted a decision on the procurement of 12 F-16 C/D Barak Block 30 aircraft from Israel for 2.9 billion kunas (around 420 million euros). Besides 12 jets, Croatia will get two flight simulators, training for its pilots and maintenance staff in Israel, aircraft weapons, a package of spare parts and equipment for ground support, infrastructure construction and adaptation, and three years of support, including the presence of Israeli instructors in Croatia. The first two jets are expected to be delivered in 2020, and the rest by 2022. At the moment the Croatian Air Force will keep 12 MiG-21 fighter aircraft, which received a general overhaul in Ukraine in order to keep them operational for another 4 to 5 years. Purchase of replacement transport aircraft for An-32. This programme is feasible after 2020 and would involve a purchase of 2–3 medium tactical transport aircraft, C27J and CN295 being most likely candidates. Programme cost: 550–580 million kuna for 2 aircraft. Purchase of up to 10–12 transport helicopters (after 2020) – replacing older Mi-8. With the Government indicating that purchase of 10 new helicopters might be the only option after 2020. Most likely candidate is the UH-60M since the United States donated two new helicopters. Programme cost: 2.5 billion kuna. Purchase of up to 8 helicopters for SAR/Medevac and ASW as well as maritime patrol – cost of programme not specified but preferences for the EC135 helicopter had been stated because MUP recently purchased 2 helicopters of this type. Programme cost for first 4 helicopters: 100–120 million kuna. Procurement of 4 additional ASW/MR helicopters will not be feasible before 2020. Programme cost for these 4 helicopters: $170–180 million if AS 565 are chosen. Purchase of 6 Aeronautics Defence Orbiter unmanned aerial vehicle. Programme cost: 100–120 million kuna, half financed by the EU. Navy plans are still being worked on but present plans call for a moderate expansion of the naval force. 10 new patrol boats, locally built, 42 metres in length. Cost of programme 750 million kuna, or 375 million for first 5 ships, first to enter service in 2018. 2 new corvettes – 80–125 metres in length. Cost of programme 3.0 billion kuna. Programme is at standstill due to lack of funds, feasible only after 2020. Overhaul of existing 2 Kralj class fast attack crafts, including new engines. Cost of programme – 40 million kuna. 1 ship overhauled in 2010/11 and 2nd should be done in 2014. Overhaul of sea radar Falcon 2 Enhanced Peregrine – programme is being financed by US government at estimated cost of $8 million. Possible purchase of 2nd minesweeper before 2020; although there are only indications that this might happen if funds can be allocated. Programme cost – 80 million kuna. As a small country, Croatia has a relatively well developed arms industry that is highly competitive internationally with significant annual arms exports. In 2012, Croatia managed to export nearly €120 million. However it has been reported in The New York Times that Croatia has been arming Syrian rebels with Croatian manufactured arms used during the Homeland War, arms Croatia no longer uses due to their obsolescence. Nevertheless, these arms played a crucial role in some significant rebel gains during 2012. As a result of these arms sales into this volatile region the Croatian government ordered the immediate withdrawal of the Croatian UN Golan Heights contingent to avoid their being targeted in retaliation. In 2013 Croatia exported €143 million worth of arms, however it is not clear if this also includes $36.5 million worth of arms Croatia exported to Jordan for Syrian rebels. Croatia was the top supplier of arms to Syrian rebels in 2013, but much of it through illicit channels without Croatian government approval or knowledge. Most of these arms were exported via Jordan. In 2014 Croatian arms exports reached 1.5 bn HRK (Croatian kuna) or €200 million or $257 million, the majority of exports being to NATO allies and Australia. In late 2014 the Croatian Defence Minister announced a major export deal to Iraq including the State of Kurdistan. This agreement includes the sale of 20,000 VHS Rifles, 150,000 complete sets of uniforms, helmets and associated equipment valued at €100 million. Croatian arms exports are growing steadily at 10–15% year-on-year and were expected to reach 1.75 billion HRK in 2015 or around €230 million, although much of the equipment exported is non-lethal. Croatian firms are well positioned on some major arms tenders in the Middle East, supplying complex military hardware such as the Patria AMV incorporating a newly developed 30mm overhead weapon station (valued at €1.25 million each) and said vehicles valued at €1.75 million. Kuwait, the UAE, and Saudi Arabia have been mentioned as potential customers, although no concrete contracts have been signed so far. Croatian firms are participating in Kuwaiti and UAE tenders for next-generation APC programmes, each valued at billions of euros. Croatian arms exports have grown steadily for the better part of this decade and have reached €325 million per year, placing Croatia in the top 10 arms exporters within NATO, behind the US, Germany, UK, France, Netherlands, Spain, Italy, Poland and Norway. The vast majority of these exports are to NATO partners such as the US, Norway, Australia, Canada, France. Croatia granted €5.75 billion in export licenses in 2016 and 2017; however, only a fraction of this sum has materialised in actual arms exports. On April 1, 2009 Croatia joined NATO and on July 1, 2013 it became the 28th member of the European Union. The Croatian Armed Forces participate in many of the (military) aspects of both organisations as well as actively participating in many United Nations peacekeeping operations worldwide. ^ a b "ŠTO SMO NAUČILI IZ NAJVEĆE VOJNE VJEŽBE ODRŽANE U HRVATSKOJ OD ZAVRŠETKA RATA? Hrvatska vojska više ne služi samo za mirovne operacije - Jutarnji List". Retrieved 2018-11-16. ^ "ŠTO SMO NAUČILI IZ NAJVEĆE VOJNE VJEŽBE ODRŽANE U HRVATSKOJ OD ZAVRŠETKA RATA? Hrvatska vojska više ne služi samo za mirovne operacije - Jutarnji List". Retrieved 2018-11-16. ^ "Croatia Military Strength". Globalfirepower.com. Retrieved 2016-05-25. ^ a b c d "Obrambeni proračun za 2018. godinu se povećava 10%" - Defender.hr - 2.studenoga 2017. ^ a b c d e "Report for Selected Countries and Subjects". www.imf.org. ^ Martina Čizmić (19 October 2007). "Nema više obveznog vojnog roka" [Compulsory military service abolished] (in Croatian). Nacional (weekly). Archived from the original on 30 June 2012. Retrieved 1 July 2012. ^ a b c d e f Alvir, Marija (March 2005). "Proračun MORH-a neće više padati". Hrvatski vojnik (in Croatian). Croatian Ministry of Defence. Archived from the original on 8 February 2012. Retrieved 9 September 2011. ^ a b c "NACRT PRORAČUNA - kupuje se Air Tractor za obuku i jedan ophodni brod do 2015". Archived from the original on 2 December 2013. Retrieved 24 December 2014. ^ a b "Nestali u tišini: Hrvatska vojska s 43.000 spala na 17.000 zaposlenih - Večernji.hr". Vecernji.hr. Retrieved 2016-12-16. ^ a b "HRT: MORH predstavio ostvarenje plana nabave za 2013. i plan za 2014". Hrvatska radiotelevizija. 6 November 2013. Retrieved 24 December 2014. ^ "Minister Buljević visits Croatian Army and Special Operations Command - Ministry of Defence of the Republic of Croatia". Morh.hr. 2016-12-09. Retrieved 2016-12-16. ^ "Special Forces Command marks 1st Anniversary - Ministry of Defence of the Republic of Croatia". Morh.hr. 2015-09-28. Retrieved 2016-12-16. ^ "Request Rejected" (PDF). Morh.hr. Archived from the original (PDF) on 2009-03-06. Retrieved 2016-05-25. ^ "Croatia plans to upgrade its M-84 Main Battle Tanks' fleet | February 2018 Global Defense Security army news industry | Defense Security global news industry army 2018 | Archive News year". www.armyrecognition.com. Retrieved 2018-12-23. ^ "Croatia has asked United States to donate 16 M270 Multiple launch Rocket Systems from US surplus 11201162 | January 2016 Global Defense Security news industry | Defense Security global news industry army 2016 | Archive News year". www.armyrecognition.com. Retrieved 2018-12-23. ^ Adamowski, Jaroslaw (2017-08-25). "Rafael to benefit from Elbit win in Croatia weapons tender". Defense News. Retrieved 2018-12-23. ^ Adamowski, Jaroslaw (2018-03-28). "Croatia to buy used F-16D jets from Israel for $500 million". Defense News. Retrieved 2018-12-23. ^ Smilović, Ivana. "USA donates two Black Hawk helicopters to Croatia - The Dubrovnik Times". www.thedubrovniktimes.com. Retrieved 2018-12-23. ^ "Croatia to establish Centre for Unmanned Aerial Systems | Jane's 360". www.janes.com. Retrieved 2018-12-23. ^ "Croatia takes delivery of first locally-built inshore patrol vessel 'Omiš'". Naval Today. Retrieved 2018-12-23. ^ "Hrvatska među 25 najvećih izvoznika vojne opreme na svijetu: lanjski izvoz 880 milijuna kuna / Novi list". Novilist.hr. Retrieved 2016-05-25. ^ C. J. CHIVERS;ERIC SCHMITT (25 February 2013). "In Shift, Saudis Are Said to Arm Rebels in Syria". Retrieved 24 December 2014. ^ By C. J. CHIVERS and ERIC SCHMITTFEB. 25, 2013 (2013-02-25). "In Shift, Saudis Are Said to Arm Rebels in Syria - The New York Times". Nytimes.com. Retrieved 2016-12-16. ^ "Croatian military output approaches USD1 billion". Retrieved 24 December 2014. ^ "Hrvatska trgovala preko Jordana: Siriji prodano oružje vrijedno 200 milijuna kuna". Novi list online portal. Retrieved 24 December 2014. ^ "Kotromanović: Lani izvezeno 25 posto više vojne opreme i oružja > Slobodna Dalmacija". Slobodnadalmacija.hr. 2015-01-30. Retrieved 2016-05-25. ^ "Izvezli oružja za 200 mil. eura, SAD ostaje najveći kupac". Wikimedia Commons has media related to Military of Croatia. The United Arab Emirates Armed Forces is the armed forces of the United Arab Emirates and has primary responsibility for the defence of all seven emirates. It consists of 100,000 personnel, and is headquartered in Abu Dhabi, UAE. The Croatian Army and Croatian Ground Army is the largest and most significant component of the Croatian Armed Forces (CAF). The Croatian Navy is a branch of the Croatian Armed Forces. It was formed in 1991 from what Croatian forces managed to capture from the Yugoslav Navy during the Breakup of Yugoslavia and Croatian War of Independence. In addition to mobile coastal missile launchers, today it operates 29 vessels, divided into the Navy Flotilla for traditional naval duties, and the Croatian Coast Guard. Five missile boats form Croatian fleet's main offensive capability. The Croatian Air Force is a branch of the Croatian Armed Forces whose primary task is to ensure the sovereignty of the airspace of the Republic of Croatia and to provide aviation support to other branches in the implementation of their tasks in joint operations. It is also the carrier and the organiser of the integrated anti-aircraft defence system of the Republic of Croatia. The Ministry of Defence of the Republic of Croatia is the ministry in the Government of Croatia which is in charge of the nation's military. The ministry was established in 1990. The VHS is a 5.56×45mm NATO bullpup assault rifle designed and manufactured by HS Produkt of Croatia. The VHS rifle was first introduced at the 2007 iKA exhibition, the annual Croatian innovation display that takes place in the city of Karlovac. The development was carried on following a request from the Croatian Army for a new infantry rifle to update the individual equipment to NATO standards. Croatia–United States relations refer to the bilateral relationship between Croatia and the United States. Diplomatic relations among two countries were established on April 7, 1992 following Croatia's independence from SFR Yugoslavia. Velebit was a modified Una-class midget submarine and the only submarine to see service with the Croatian Navy. It was built for the Yugoslav Navy during the 1980s where it was named Soča. At the outbreak of the Croatian War of Independence Soča was being overhauled in the Brodogradilište specijalnih objekata division of Brodosplit shipyard in Split, Croatia. Although stripped of all equipment, it was preserved from the retreating Yugoslav forces by the shipyard workers. The 1st Croatian Guards Corps was a special formation of the Croatian Army directly subordinated to the Ministry of Defence rather than the General Staff of the Armed Forces of the Republic of Croatia and reporting directly to the President of Croatia. The corps was established in 1994 by the amalgamation of various HV special forces. The 2,500-strong unit was organised into the 1st Croatian Guards Brigade, a multi-purpose special forces combat unit, and four battalions tasked with ensuring the security of the President of Croatia and carrying out ceremonial duties. The HGZ took part in a number of military operations during the Croatian War of Independence and the Bosnian War. It was disbanded in 2000, when its components were amalgamated with other HV units to form the Special Operations Battalion, the 350th Military Intelligence Battalion, and the Honour Guard Battalion.